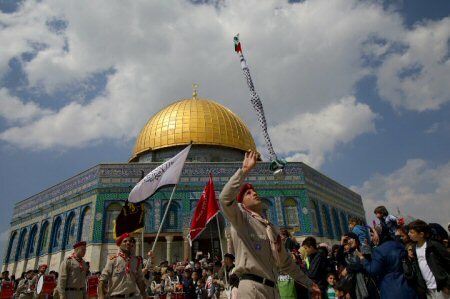 Tens of thousands of Palestinians observed Al-Isra Wal Miraj Muslim holiday, today, with worship at Al-Aqsa Mosque, in Jerusalem’s Old City, the site of this holy day, thus the religious significance of Jerusalem and specifically Al-Aqsa Mosque, to millions of Muslims worldwide, as scouts marched through the city streets playing all kinds of musical instruments. Eleven scout bands with some 600 members marched through the streets of East Jerusalem and its Old City alleys as thousands of people gathered at Al-Aqsa Mosque to worship this important Muslim holiday. Al-Isra Wal Miraj is observed every year on the 27th day of the Islamic month of Rajab, almost one month before the start of the holy fast month of Ramadan. The date changes every year in the Gregorian calendar.